I had intended for my next post to be something more camera related, but last night I had a food experience in Newcastle that I just had to share with you all. Last night my boyfriend and I didn't know what to do with ourselves, as usual, so we figured we'd head to Beaumont Street and find somewhere to stuff our faces. As I drove along the rows of houses behind the main street trying to find a park, my boyfriend noticed a place that looked new so we decided to check it out. We eventually found out it was called 'Dumpling Story'. Walking up to it you wouldn't know it was a restaurant serving Chinese food. It was very modern looking. Nothing was red, there wasn't really anything written in Chinese anywhere and there were none of those little cats with the bobbing hands. Instead the walls were lined with dark pallets and real cool art pieces. I especially loved how they had gotten the mechanism from inside a piano that works the keys and stuck it on the wall. Everything else was pretty much white and clean looking. We figured this place was new in town but we had no idea how new until the waitress told us it was their first night open! 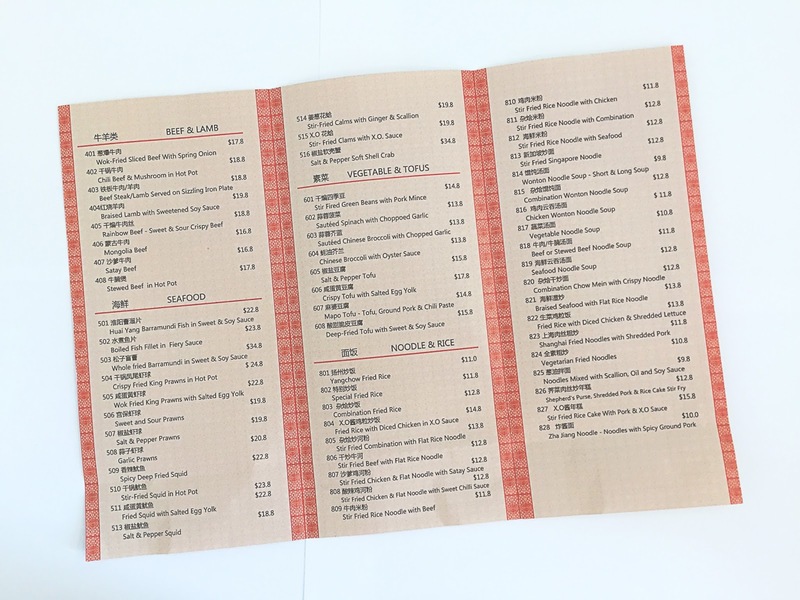 It was a little bit exciting to realise we had managed to just stumble upon a brand new place and be one of the first few customers through their door. 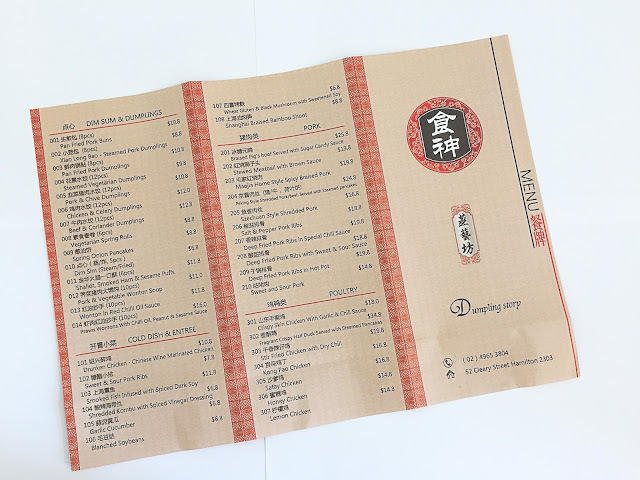 There were a few things on the menu that weren't available, but as soon as we'd seen dumplings on the menu that was all we needed to be happy. I ordered the Chicken and Celery Dumplings (12pcs), my boyfriend got the Pork and Chive Dumplings (12pcs) and we also got some Vegetarian Spring Rolls (6pcs) to share. In terms of the food can I just say, OMG! I've only been to a few different dumpling places, but I have to say that so far these have been the best I have had. I didn't try any of the pork, not being a fan of it myself, but the chicken ones were damn good! The spring rolls were also amazing, a generous size and tasted authentic. All up, along with my boyfriend's ginger beer, the bill only came to $31.60, which for the quality I thought was pretty damn good. There are no drinks currently on the menu, but the waitress did offer us tea and your usual soft drinks. There was a chalkboard that had 'fresh smoothies' and 'fresh juice' written on it, so hopefully they start serving those soon. Being the first night and the fact no one really knew about it, there was none of the buzzing noise that comes from a place being filled with people yelling to try and be heard over everyone else. It was nice to sit down somewhere fairly quite and be able to hear the person across from you with ease. Not only was the food amazing, cheap and served in a trendy looking place, after we paid at the counter we also got given mini gift bags! 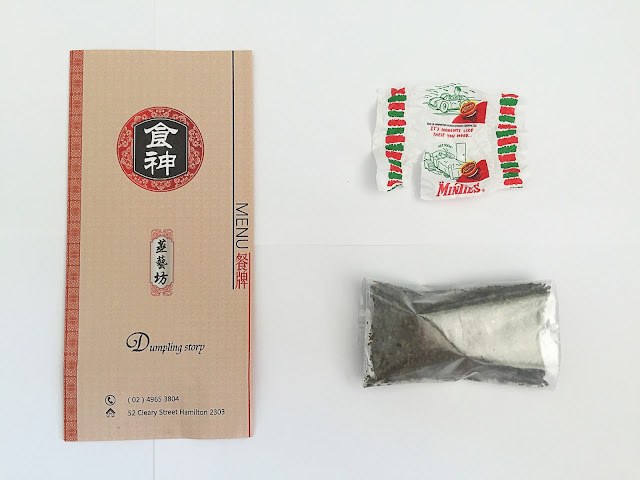 We got a menu (which made me way to happy), some Minties and a small bag of tea leaves, which I thought was the cutest. I got Peppermint and my boyfriend got Lemon Grass and Ginger. We figured they were the tea leaves they would used in the actual restaurant itself, so I'm keen to try it out. Being so new they don't seem to have any places where you can find them on the world wide web, though a chalkboard inside the restaurant did say to go like them on Facebook. So if you're reading this in the future then they probably have something now if you just do a quick Google search. It wasn't until we were driving away that I thought I should probably do a post on this place, it being so new and all, so unfortunately I don't have any pictures of the inside or the food. Just Google dumplings and spring rolls though and you can pretty much see what we ate. I guess you'll just have to go check it out for yourself to see what I'm talking about. Overall it is an amazing place with equally amazing food and I know my boyfriend and I both walked away with good feelings and knowing we'd had a great experience. It's always nice when something exciting happens in your night that you hadn't expected. I can't wait to go back and try some of the other options, if I can muster up the willpower to not just buy those amazing dumplings each time. I would definitely recommend you go and check it out if you're a fan of Chinese food and looking for something that just tastes down right amazing.